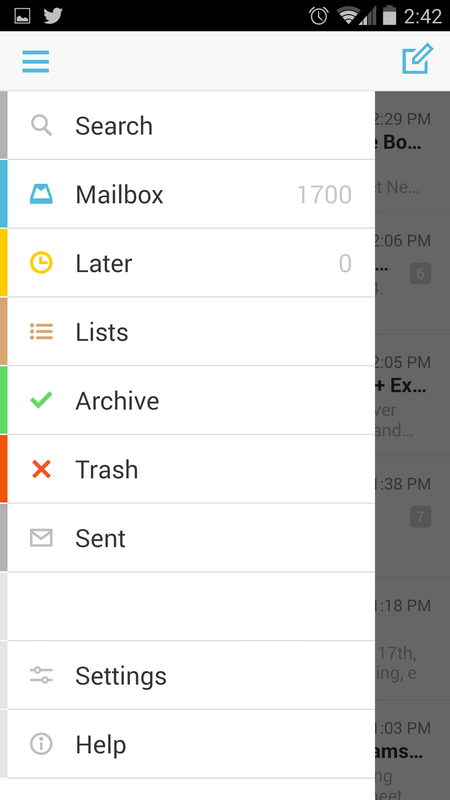 After being acquired by Dropbox, the company finally announced that Mailbox has officially arrived on Android. For those of you who’ve been waiting over a year to see what the fuss is about, here’s a run through of the features included. If you’re familiar with your phone’s Gmail for Android app, you’ll notice that swiping right similarly enables the archive function. Unlike Gmail, the other functionalities cannot be triggered without pushing some sort of button. 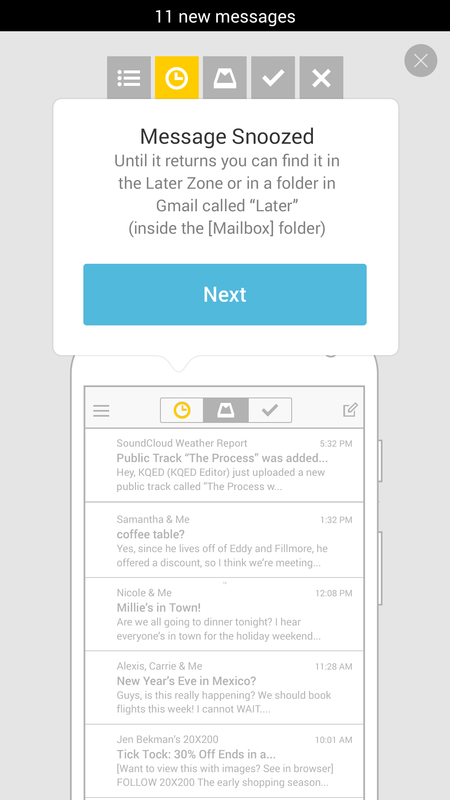 By far, the most interesting management part of the app is the ability to snooze your email for later use. When you swipe left, you’ll get a prompt on when you’d like to revisit the email (tonight, tomorrow, pick a date, etc.) This is particularly useful for when you need to remind yourself to reread the email or follow up with someone – and do it within the app instead of setting an external alarm. The list feature is also great for organizing work emails into various tasks. For example, I currently split my emails into three folders: Freelancers, Sponsors, and Core Editorial. The ability to sort the mails into lists with just swipes help to prioritize each task when I find time to respond to each email. You can also make your own lists, such as “To Read,” or “To Watch,” if you plan to use this outside of work. With the launch of Mailbox’s Android edition comes the “Auto-swipe” feature that will recognize your archiving and snoozing patterns to learn how to process future emails. For example, if you are constantly snoozing emails from your ex until year 2025, Mailbox will supposedly learn to hide those emails away until you’re ready to deal with them. Similarly, in a more realistic use case, if you are sorting e-receipts from purchases to a specified list, Mailbox will know to do this immediately. It’s a bit hard to test this feature for now as it will take time for Mailbox to collect data, but it’s an interesting concept on sorting your inbox in a way that goes beyond Google’s Promotion and Social tabs. Now that you are able to sort most emails right when you receive them into various lists and folders, the idea is that your main inbox is as freed up as possible. You can access your sorted mail with the top navigation bar, which is split into three icons: Snoozed, Inbox, and Archived. A side drawer navigation also shows the full menu. TNW’s Editor in Chief Martin Byrant swears by Mailbox’s organization functionality, and while I’m still just getting used to the app, here’s hoping that Mailbox soon learns how to sort my Promotion and Social mails that were previously auto-filtered by the Gmail app. As you can see in the screencap to the right, with 1,700 emails to file, I’ve still a long way to go. So perhaps Mailbox isn’t drastically different than what Gmail currently offers, but we have a feeling that once you begin relying on auto-swipe to categorize your emails, it’s going to be a feature you can’t imagine going without.